Scientists have calculated the water temperature at which tiger sharks are most active and abundant. They say the sharks, which are second only to great whites in attacking people, prefer a balmy 22C. Shark populations may shift range as the oceans heat up, bringing them into greater conflict with humans, according to the scientific study. For instance, tiger sharks may move into waters off Sydney in both winter and summer months. Dr Nicholas Payne of Queen's University Belfast and the University of Roehampton led the research. "Our study suggests that 22 degrees is not too cold for the animals and it's not too hot for them," he said. "It's about right in terms of their optimal preference for temperature." Most sharks are cold blooded. Their body temperatures match the temperature of the water around them. The research, reported in the journal Global Change Biology, could lead to new ways to predict when and where tiger shark attacks might happen. Increases in coastal water temperatures of one or two degrees could lead to a southern shift in the population of tiger sharks. "At the same time places like Sydney might start to see more tiger sharks during winter months whereas at the moment you very rarely see tiger sharks in Sydney in winter," Dr Payne added. In some parts of the world, governments are trying to find ways of dealing with the problem of shark attacks on surfers and swimmers. These measures include culling programmes, which are highly controversial. Providing more information on where sharks go and what they do at particular times of year could help in the planning of strategies to prevent shark attacks. To find out more, the researchers studied tiger shark catches off Australia's eastern coast over several decades to get a picture of where the animals were most abundant. 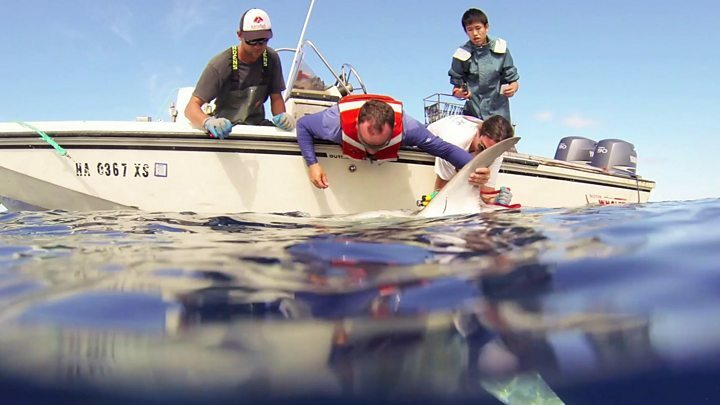 They then attached cutting-edge electronic devices to the dorsal fin of tiger sharks living off Hawaii. The tags on the sharks measure water temperature and have a motion sensor to measure the shark's activity and swimming speed. "It was really cool because it allowed us to get an idea of how active these animals are as they swim around in the ocean and how temperature affects their activity levels," said Dr Payne. While overall numbers of tiger sharks are unlikely to change with ocean warming, we are likely to see shifts in the distribution of the animals, he explained. Concerns over global warming have led to studies of how animals might adapt. Marine animals appear to respond more rapidly to climate change than animals living on land. Surviving a shark attack: Do you really have to punch it?